The earliest grant of land in what is now Rockport was to James Babson in 1658. It consisted of 32 acres in the area long known as Beaver Dam. 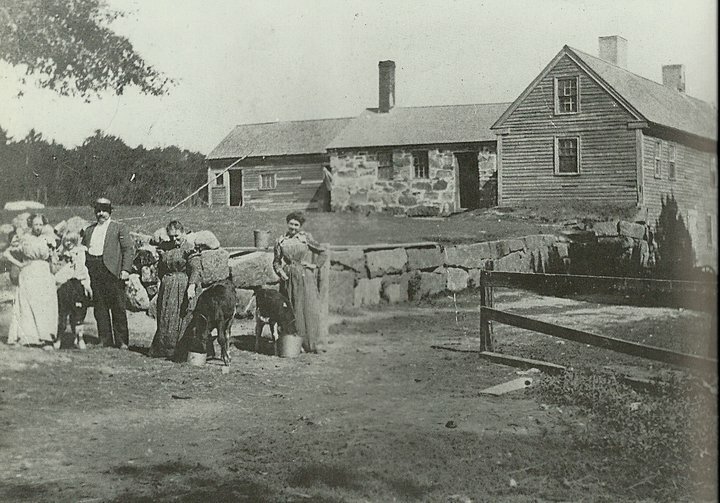 After Babson acquired it, the property became known as the James Babson Farm. Here, Babson built this cooperage shop, where he built barrels that were used to ship fish from Good Harbor Beach to England and the West Indies. The building still stands and is maintained as a museum by the Babson Historical Society. Babson was born in England in 1622 and came to Salem in 1637 with his mother and brother. By 1642, he had moved to Gloucester. He died in 1683 at the age of 61. He was a forbear of Roger W. Babson, the founder of Babson College and the man responsible for the Babson Boulders in Dogtown. James Babson’s son, Ebenezer, was the man who supposedly killed a bear on what is now known — thanks to him — as Bearskin Neck. In the late 1800s, the property was owned by Patrick Nugent — the namesake of Nugent Stretch, the name for the stretch of road where the property sits. I believe that is Nugent and is family in the photo above. At the time of his death in 1900 at age 51, Nugent had been restoring the property “to its old time appearance,” according to a report in the Gloucester Times. At some point, Nugent operated a fertilizer plant on the property. I found one news report saying that, after he died, an East Boston fertilizer company planned to move its operations to the Beaver Dam site, although I cannot confirm that ever happened. In 1913, one of Nugent’s sons, John, died a tragic death when a frightened horse caused him to be thrown from a wagon. Just three months later, another of Nugent’s sons, Robert, died on the Beaver Dam property when he was thrown from a motorcycle. In 1925, the then-vacant house was set on fire by two boys looking for some excitement. Fire fighters were able to save it without much loss, according to a news report. This postcard was published by Artvue Post Card Co., New York. There is no date on the card, but Artvue started publishing in 1936 and continued through the mid-1960s. Thank you so much for all your hard work to produce this blog. It makes me very homesick for Rockport. I look forward to each entry. Wonderful historic info for genealogist and others. Where does Col. Joseph Foster come into this story ? This was his home also. I did not know about that. I do know that Col. Foster had a home in Gloucester on Middle street. Where did you find the information that he lived here? In just about any book that he’s mentioned in. Joe Garland’s Guns off Gloucester for one. His son Capt. Joseph was also married there.